The market of luxury saloon is big and from the Jaguar Jungle (we won’t call it as stable) XF and XJ were giving tough competition to rivals like E-Class, Audi A6 and BMW 5 series. But asmall animal from Jaguar was missing to compete with the 3 series, C-class and the A4. When Jaguar wanted to make rival of this segment from its Jungle, the company thought of something else than just a rival, a product that is luxurious, a class apart and yet in the same segment but positioned a little higher than its rivals for its brand value. What it takes for a car to become a Jaguar? Well, lots of working hours, rigorous testing in rough terrains, extreme climate and driving on every road that is available on earth. With all these XE was born and it was first showcase in India and was launched at the 2016 Auto Expo earlier this year. The red hot Jaguar XE was unveiled by Bollywood Diva Katrina Kaif. We were not interested in Katrina Kaif so we all auto enthusiasts concentrated on all new Jaguar XE. We were lucky enough to test the top of the line XE 25t also known as portfolio model. It’s a compact sports saloon, pretty much the heartland car for anyone who has a decent regular job, a couple of kids and a smattering of Coldplay and Adele albums. 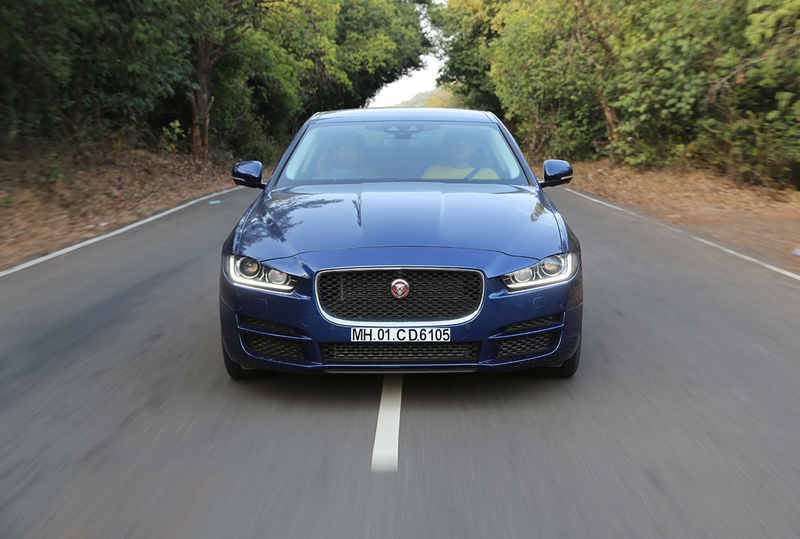 Like the larger XF and XJ, the smallest Jag sedan wears a body structure made mostly from bonded and riveted aluminum. The steel bits—all four doors, the trunk-lid, and the floor pan aft of the rear seat—are strategically located to shift the weight distribution toward the driven rear wheels. 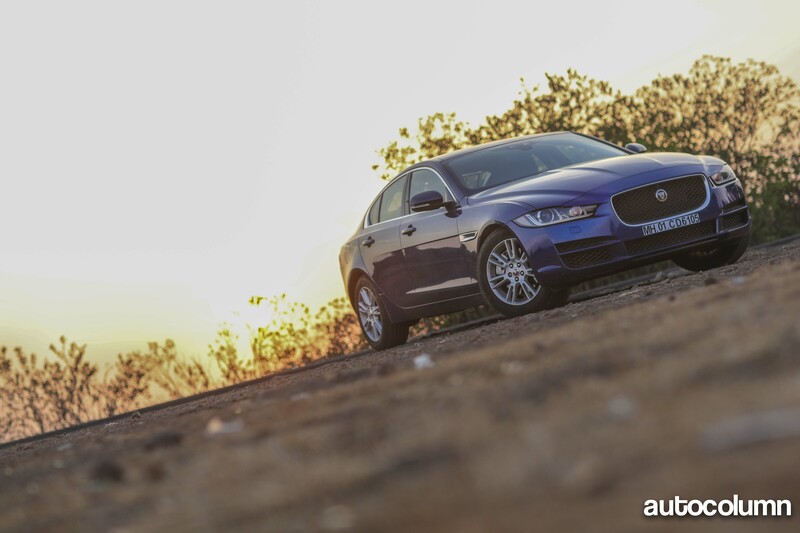 The XE’s cabin feels robust and alluring to touch, but the controls are dated. The center console features an 8-inch touchscreen above two rows of small rectangular buttons, which are hard to distinguish when you’re hunting for the seat heaters or air-con blower strength. A rotary fan controller would be so much easier than stabbing at a plastic switch, while scanning the console for staple-sized LEDs that denote which setting the blower is on. When everyone is going digital in this part of the car, Jaguar remains analog in the controls. The circular design of the dashboard flowing from dash to windows gives a good feel inside the cabin of surrounded luxury bits. Touch screen infotainment and Meridian audio system is just another luxury boasting in this car. 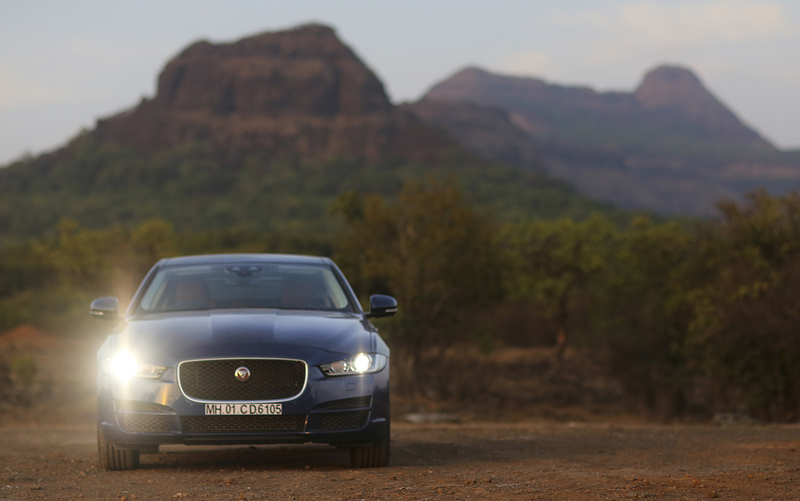 XE portfolio version comes with 2 liter turbocharged petrol throwing 240 bhp of peak power and 320 Nm of peak torque. This engine is beautifully coupled with 8 speed gearbox that takes this car from standstill to 3 digit number in just 6.8 seconds. The refinement levels are way ahead of its competition even can think. The soothing grunt of petrol engine audible to some extent only when you try to push this car than regular chauffeur driven limits and that’s where the aggression part starts. Power delivery is very linear so it builds up to the 240bhp and one can feel every bit of it in the driver seat. The Eco mode on this car showed a real-time fuel economy number of 18kmpl for a petrol variant of this portfolio version. This is a very substantial number for a petrol car. We got this number in combined driving of the car from heavy Mumbai traffic to Chaotic Pune streets covering almost 800+ kms till we bid adieu to the XE. The best of XE comes here. All I can say is Jaguar has killed BMW 3 series in its class for the handling. Till date I was really happy with BMW 3 series for the best in class handling after driving C-Class, E-Class, A3 and A4. But this baby Jag has nailed it all. Almost 50:50 weight distribution and light chassis throw the power at rear wheels making this car very agile and swift in the corners. Even at the speed at 200 kmph, the confidence to the driver is enormous due to its best handling package. If you are not interested in pushing the car and just want to be chauffeured driven, the car changes its character and this is the best part that this Jag offers. On a weekday, you can drop your kids to school and in the same car you can hit race track on weekends to have enough fun. 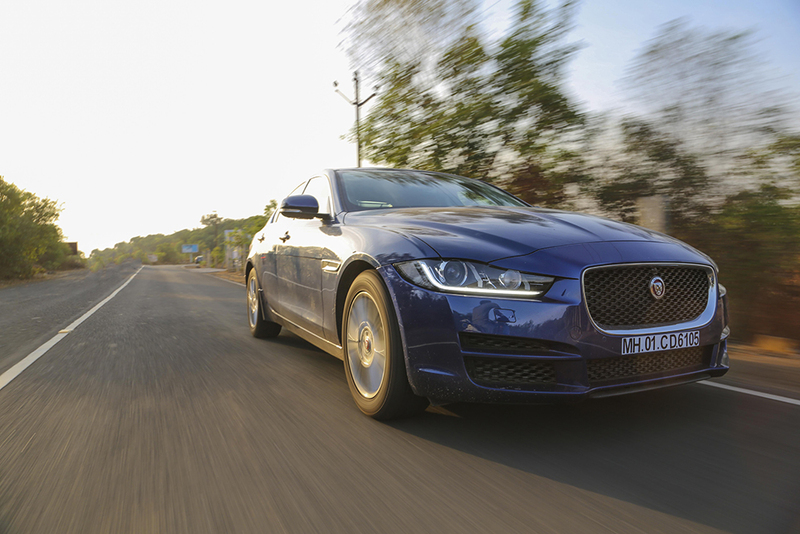 Compared to its rivals, the XE is almost 9 lakh more than BMW 320i Luxury Line and 11 Lakh more than Mercedes-Benz C200 Avantgrade. Just like its rivals XE also comes to Indian market via CKD route but with a bit of higher price tag for its brand which is still exclusive, unlike BMW and Mercedes-Benz. All in all, Jaguar entered this segment very late with a product that is very much matured for its segment and offers a bit more than its rivals in terms of brand, exclusivity, comfort, power and driving pleasure. What else does one look for?